Our ride begins in the dark, a quiet shadowy morning on the road. The chill of the morning clings to all layers and makes our noses run. We begin to climb, a consistent cadence that drives us ever forward. When we look behind us, the top of a peak glows pink, but the rest of the forest is dark and still, save the creek rushing downstream next to us. With every foot gained, new mountains appear- jagged topped and snowbound- appearing all around us. At times, a low stone wall is all that separates the road from a descent into a valley thousands of feet below. But the road is mostly ours for the first many miles, so we feel comfortable chatting and singing and sharing stories as we crank our way up with our new friend Sarah, fellow touring cyclist that we’d met the day before. More and more light reveals more and more mountains until we are surrounded by their shadowy forms all around. 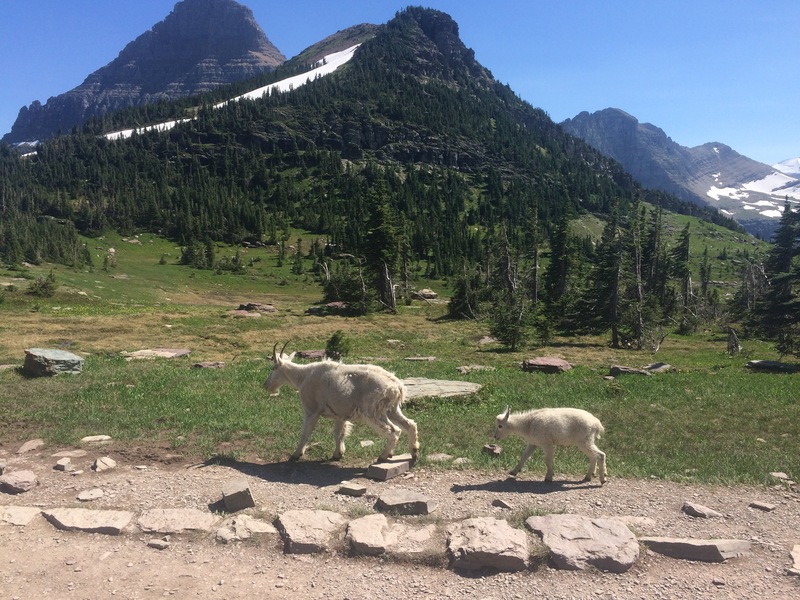 So goes our journey up Logan Pass and Going to the Sun Road in Glacier National Park. 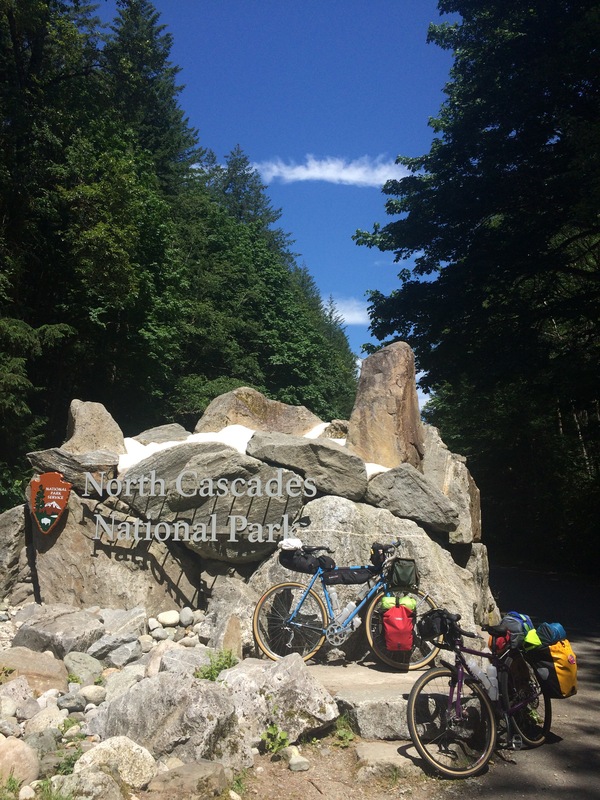 Jeff and I spent the beginning of our trip traveling through four National Parks in the US and Canada: North Cascades, Glacier, Waterton Lakes, and Teddy Roosevelt, experiencing them from the seats of our bicycles along the Northern Tier and Lewis & Clark Adventure Cycling routes. 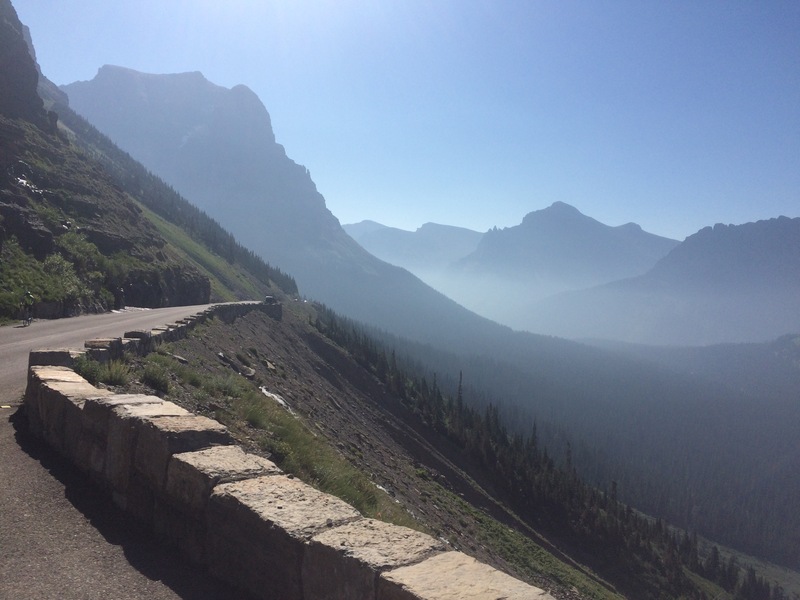 The most memorable cycling-wise was the famed Going to the Sun Road. We have found on this trip that our exploration of public lands has been far away enhanced by the openness and perspective that the bikes provide. After all, what would the National Parks be without the slowness of travel and exploration that prompted their founding and protection in the first place? As we climbed Washington Pass in the North Cascades, we were able to smell Lodgepole Pines and feel snowmelt waterfalls spraying us as we passed. We could hear marmots calling out into cool mountain air in Glacier. 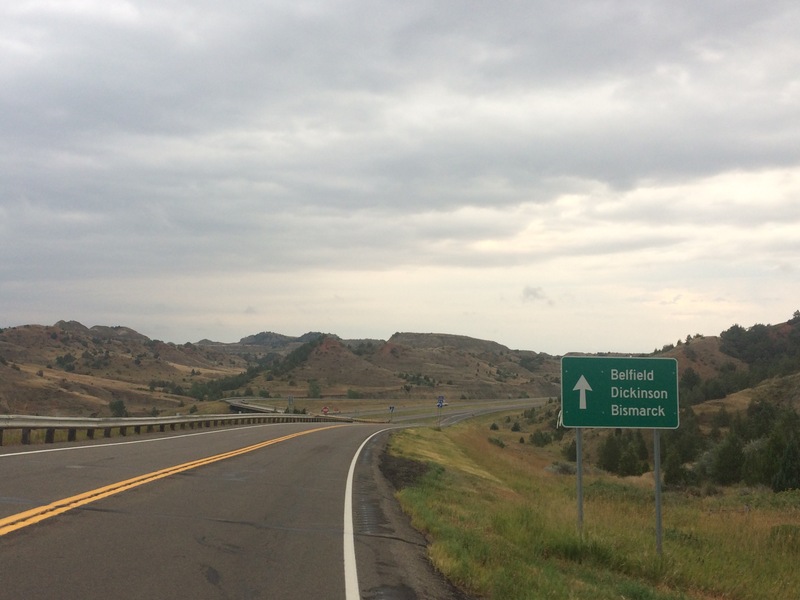 And riding through Teddy Roosevelt, colliding with bison did not seem like a far fetched possibility. The world seems so much closer while riding a bike, all senses flared, so what better mode of transport is there to see the best America has to offer? Edward Abbey seems to agree. In his essay “Polemic: Industrial Tourism and the National Parks” published in his 1968 book Desert Solitaire, the famed environmental writer contemplates an expensive and jarring road building project in Arches NP that, in turn, brought millions of motorized visitors to the park. As the title of the book suggests, Abbey sought solitude in his career as an employee at Arches, and despised the building of the road. He believes that the roads in National Parks should be thoroughfares for bikes and horses and feet, not cars. Though I won’t go as far as to denegrate road building in National Parks, as we have enjoyed the pavement that has guided us through them, I am intrigued with his idea to heighten the status of non-motorized travel through our parks system. 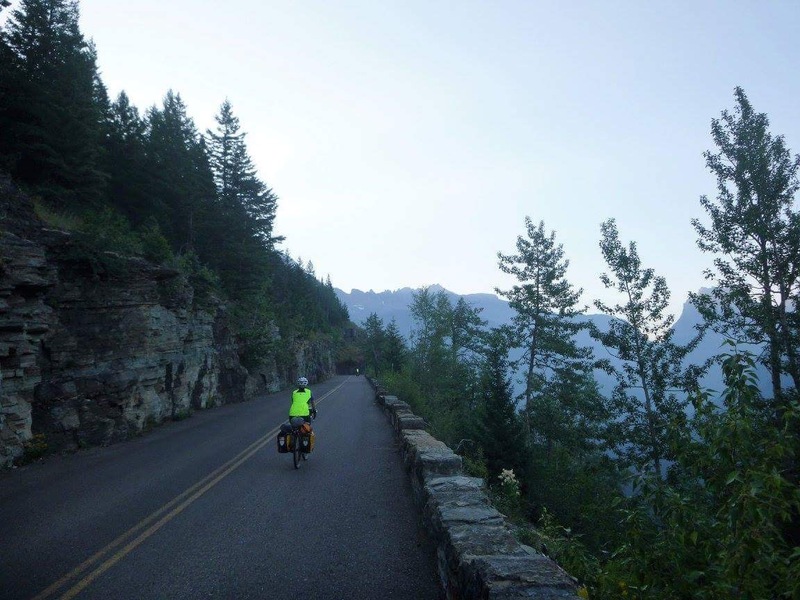 Going to the Sun Road in Glacier is deemed one of the most scenic cycling roads in the world because of its scenery and winding trajectory. While we were in Glacier NP, we traveled the extent of the road over a 2-day period, stopping to camp and hike along its length. Though we preferred to travel this slow to take it all in, our pace was also a product of safety. Yes, the campgrounds lining Going to the Sun Road always reserve space for “hiker/bikers” and the gift shops sell posters picturing people riding bikes backed by stunning vistas, but at the end of the day, the roads through the National Parks were made for cars and cater to them. 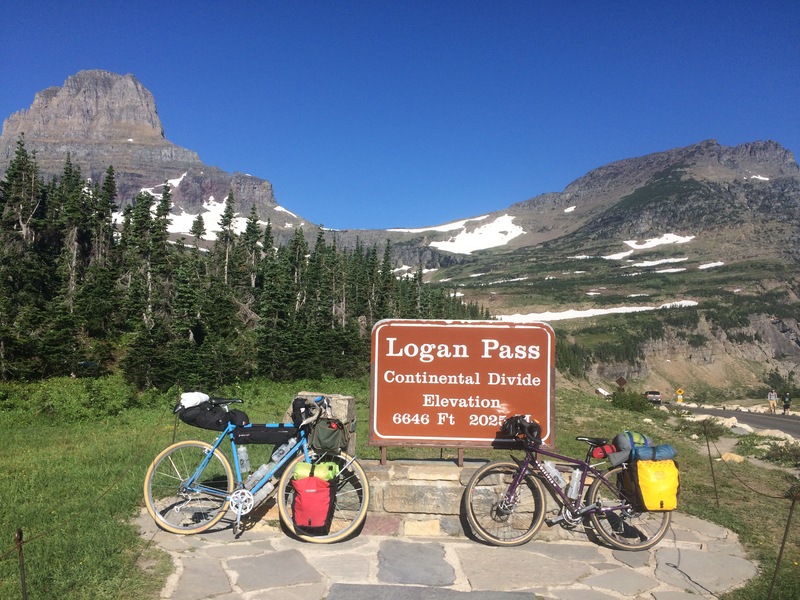 For instance, while in Glacier we could not ride between Sprague CG and Logan Pass between 11 am and 4 pm, which is what prompted a 2-day ride. Even though we left ourselves plenty of time to reach the top of Logan Pass, we still had cars passing us along the very narrow winding road with 6 inches to spare at times. Going to the Sun Road was one of the most memorable rides of my life. But it got me thinking: why not restrict cars as well? Give bikes a few hours per day to enjoy the roads unencumbered, or as Abbey says, “Let our people travel light and free on their bicycles — nothing on the back but a shirt, nothing tied to the bike but a slicker, in case of rain.” If cars are going to complain about passing bikes in the road, why not give us a chance to separate for a little while and not always be sharing space? Luckily, has the sights and smells and sounds of the National Parks we visited far overshadowed the fact that bike-centric infrastructure was not available to us most of the time. In North Cascades NP we took rest breaks from climbing to look out onto Ross Lake or see the slow peek of more and more mountain tops as they appeared throughout our 6 hour climb to the top of Highway 20. Despite this being a major thoroughfare for every kind of traffic crossing northern Washington State, by virtue of it being US Bicycle Route 10, the road actually had generous shoulders to aid our progress and plenty of small, chilling waterfalls in which to wet our caps and satiate our thirst. 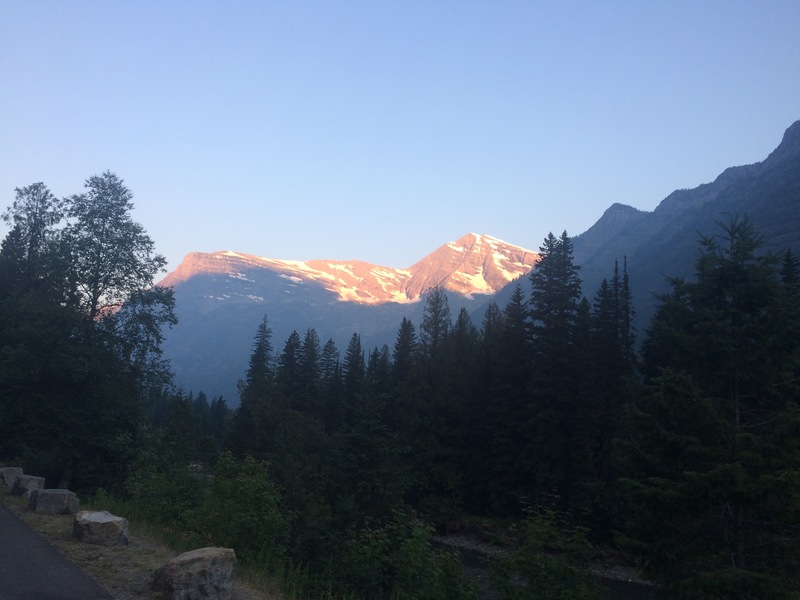 And though it didn’t have hiker/biker sites like Glacier did, our short jaunt through the frontcountry of North Cascades was a breathtaking beginning to our trip. Abbey asks an intriguing question in his essay, one that every National Park go-er should contemplate: “Why is the Park Service generally so anxious to accommodate that other crowd, the indolent millions born on wheels and suckled on gasoline, who expect and demand paved highways to lead them in comfort, ease and safety into every nook and corner of the national parks?” He suggests, and rightly so, that maybe National Parks should focus, instead, on prying people outside of their cars and onto trails for bikes and horses and feet instead of catering to them by building more roads. Teddy Roosevelt visited the North Dakota Badlands by horse, feeling the land below his feet as he rode amidst hills striped with multicolored rock. We can do the same today by bike, only sharing the road with cars and bison. 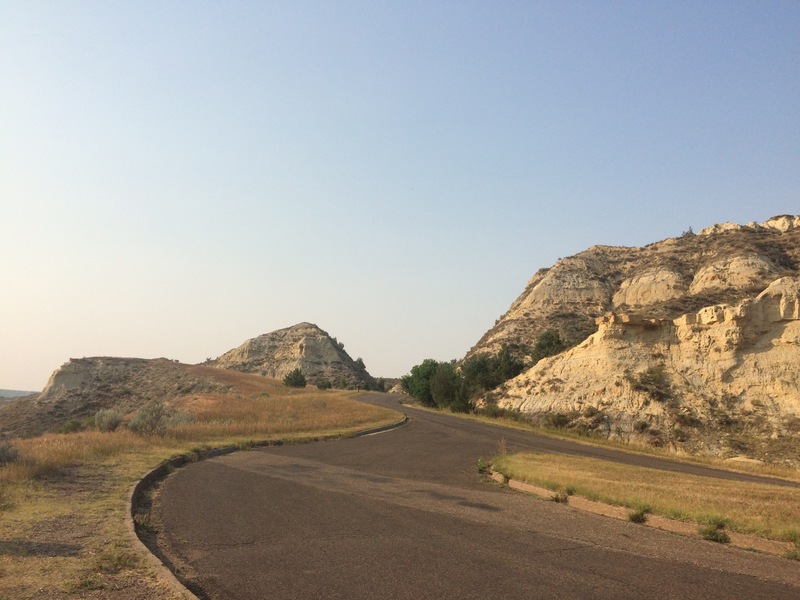 Interstate 94 cuts directly through the park, arguably increasing possible visitors intrigued by the beautiful geology, but doesn’t that also cut into the mystery that is inherent to exploring wilderness? Because we choose to travel by bike, we also choose the vulnerability that comes with prying ourselves out of a motorized vehicle. Exposing ourselves to the world and fast traffic is a choice we make to travel under our own power, see the world in a more raw state, and feel unencumbered by possessions for a little while. But wouldn’t it be nice to feel just a tad safer while gawking along with the rest of them? Tags: Adventure Cycling, bicycle touring, bicycles, Make America Bike Again, mountains, park, travel. Bookmark the permalink. You strong woman! I think all the NPs you visted would benefit from reading your experiences on bikes. You might as well tell Ryan Zinke, the new Sec. of the Interior, from Whitefish, Montana, too. He is busy evaluating sizes of 20 some National Monuments. Great idea for times for bikes, horses, and on foot travelers! A magic wand would be handy!